My Emma recently discovered “I Love Lucy” and like millions of other, she is utterly enthralled by Lucy. The entire thing came about because Tom and I happened to be talking about the episode with the Vitameatavegimin and she wanted to see what we were giggling about. Needless to say that it’s been weeks and she’s slowly working her way through the entire episode listing on Hulu. Yes, my 10 year old is choosing to use her t.v. time to watch “I Love Lucy” over anything that was made today. I am 100% totally okay with this. Because the family t.v. sits right outside of my office, I can often hear her giggling at the show and I have to smile. It reminds me of my first time watching those same episodes and of how I giggled and laughed the same way that she does. I can also hear the episodes themselves and yes, I find myself chuckling along with her. I have to wonder if Lucille Ball knew while she was here with us if her gags and jokes would still be bringing people joy for years after she passed. I certainly hope that she did. I tell you all of that not to bore you (sorry if I did!) but to set the stage for this post. 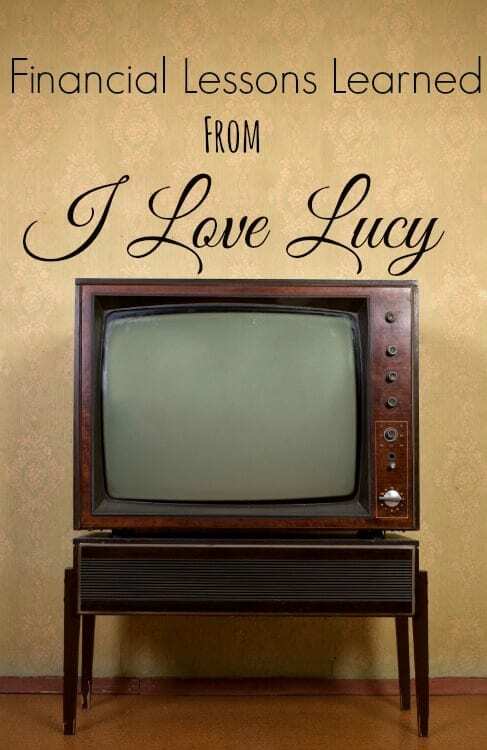 One day last week, Emma was watching “I Love Lucy” like always. Specifically, she was watching the episode “Oil Wells.” If you don’t know that specific episode, let me recap it for you very quickly. Lucy, Ricky, Fred and Ethel all have the opportunity to invest in Texas oil. They buy their shares and then proceed to do something that a lot of us do. Lucy shows up in a fur coat, Ethel in a mink stole. Fred has spent money as well and Ricky? Custom Cadillac. All of this before their oil wells had even struck oil. Needless to say, typical Lucy hijinx ensues and before too long, they’ve gotten their money back and ripped up their shares only to find that immediately after the oil well struck oil and they just barely missed their chance to be rich. As I was listening to this episode, I was immediately struck by how similar their actions are to a lot of ours today. I touched on this the other day in my post that told you the one thing that your Grandparents knew that you don’t, but I think it is so important that I’m going to say it again. You can’t spend money that you don’t have. In the episode above, the 4 characters spend money that they don’t really have to spare (although they certainly weren’t hurting to pay their bills), before they even have it. While we don’t see what happened after the episode ended, it isn’t hard to imagine what real life would have been like. They would have had three options: pay for the items, return the items or try to pain and fail only to have the items repossessed because they were bought on credit. In another episode (although the episode name escapes me), Lucy has spent the bill money and Ricky decided to take her allowance until it was paid back. Again, we run into the same lesson. Since humans started using a monetary form (be it salt, silver, gold or paper dollar bills), credit has always been available and throughout those years, countless numbers of people have gotten into trouble with it. Credit, at its very core, is the very simple act of spending money that you don’t have. I don’t care if the money technically came from your checking accounts. You’re not spending your money. You’re spending someone else’s money. I don’t know about you, but I’m not comfortable at all spending someone else’s money. I would hope that you aren’t either. Instead of doing just that, budget for what you need so that you are able to save for what you need. If it helps you to not have everything in your main checking account, set up a separate savings account to use for whatever you’re trying to save for. When I do this, I prefer to use an online account. This gives me time to really think about the purchase before the money hits my regular checking account. Usually 2-3 days which is more than enough time for me to mull over whether I really and truly need to buy something. The entire point of all of this is this: Whether you’re preparing yourself for your regular budget or a big ticket purchase, take a lesson from Lucy. You can’t spend money that you don’t have. Credit isn’t the answer for 99% of the things we buy and like Lucy would have surely found out if the above situations had been real, spending money that you don’t have or living solely on credit will only lead to big fat “I Love Lucy” tears. So there you have it….who would have thought you could learn a few financial lessons from such an awesome show?